The World of Althéa: Armour Appearance Answers! The Wrong Way: I have decided that this is the wrong way to work with NPCs when placing armour on them. 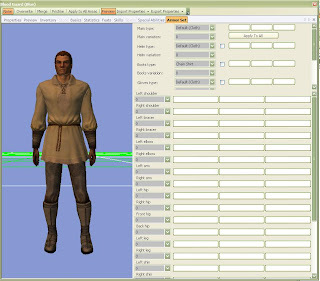 That is, if you access the properties on a creature and alter the Armor Set values that are on them. 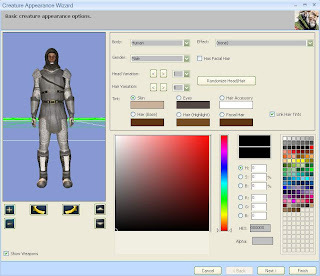 While this may appear to be adding or altering armour on the creature, all it actually doing is giving an armour appearance, which cannot be accessed by a player after the NPC is killed. Maybe this facility is useful in some instances, but it does remove the facility for players to pick up actual armour objects within the game. Therefore, I believe that this section of the toolset can be ignored in most cases. I recommend that the Armor Set values are not altered in any way on the creature, unless you never intend the player to be able to pick up or have access to the armour object upon the creature. 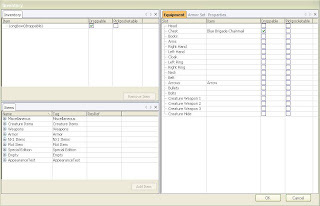 This picture shows the default values upon the same creature shown above that had had its Armor Set values altered. 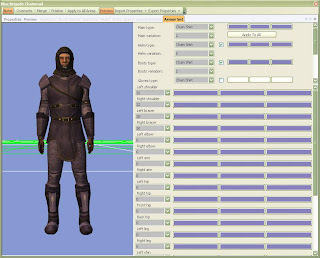 1) Use the Armor Set options within the item properties window to design the new armour object. All aspects of the armour can be designed through this section, including armour parts and their colours. NB: These Armor Set properties for the item look very similar (identicle?) to those with the same name on the creature. Do not confuse which section to work on: Work on the item and not the Creature. 2) Make sure the new armour is actually equipped to the NPC and has replaced any default armour that was equipped with the creature at the time of its default creation. 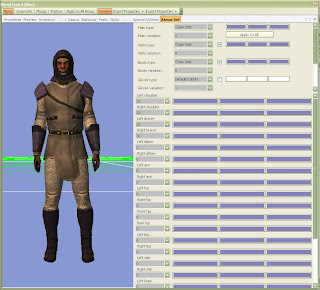 This is done by first adding the newly created armour object to the creatures inventory. Next, remove any currently worn armour (from the right hand pane of the inventory panel) and add the newly designed armour to the right hand pane instead. (Drag armour object from the left-hand pane into the position on the right-hand pane.) Make it droppable. 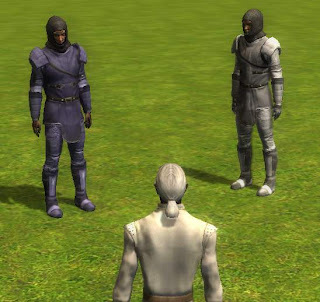 Then, when the NPC enters the world, they will be wearing the new armour and it can be picked up from them by the player. 3) There is one more thing to be careful about, and that is to ensure that the NeverShowArmor property is set to FALSE upon the creature wearing the new armour. If it is set to TRUE, then the NPC will have their armour appearance properties take priority (see above) and even though they wear the new armour object, it will not show in game. 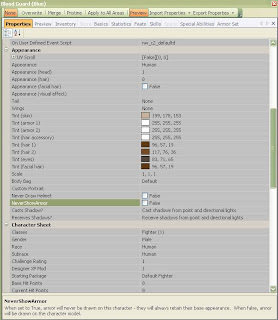 There is one more thing to be aware of when using the toolset to set the appearance of creatures and that is when using the Appearance Wizard when right-clicking on a creature from the blueprint window. Its opening window can be very misleading, as it will initially show the creature wearing any armour that you have equipped on them. Yet, if you click on the Next button and then use Back to return to the initial screen, it will then show the creature in its natural state without any equipped armour - which is how it should have appeared in the first place! I believe this wizard is to be used in the same way as the Armor Set properties that can be found in the creatures properties. (See above.) Therefore, like my initial reasoning, unless you intend to use this instead of an actual armour object that can be dropped and picked up in the game, then its usage can be avoided. Here is a picture of the end result, with two guards with two different armour types that will drop the armour to be available in game.